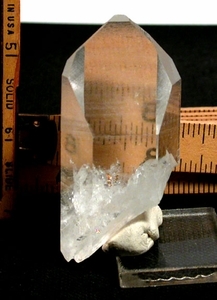 Here is a 15/16x 1-1/4x 2-7/8" high wonderful 8-edged channel faced [rare] Arkansas crystal with an uncommon 7h face. Three faces and sides are lightly -barely- frosted, the others silk smooth - you can read right through this stone if you please. Raised record keepers, base in lacy regrowth [Hera crystal], rainbow foils spread up from the base. Three negligible fleas won't detract from your prize.